Yep, this can be a life saver for tough mysterious problems. Robert Jennings, owner of Professional Plumbing, a licensed and bonded plumbing contractor with nearly three decades of experience, now offers state-of-the-art pipeline and sewer video inspection. He is available 24/7, nights, weekends, and holidays to provide sewer camera/detection services and immediately find the source of the sewer line problem. Ou r state-of-the-art equipment can discover blockages caused by grease accumulation, unusual debris, damaged or separated pipes, even patches of grass or tree roots. A sewer video and line detection service can often scope in precisely on the source of the problem where other methods require too much hit and miss demolition, which can be very expensive. 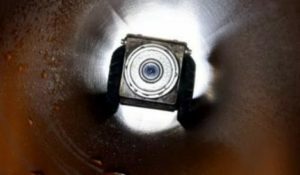 Our micro-cameras can detect root intrusions, cracked sewer laterals, leaking joints, deteriorating pipes or drain lines, and blockages. If you are in need of video inspection, call Robert now.